We eat out a lot, but I wouldn’t want you to think it’s all 10 course tasting menus from restaurants with multiple stars in the Michelin Guide. We eat high on the hog, we eat low on the hog. Today, we were on the low side. I noticed in Gatlinburg last April a number of places offering chicken and waffles, which seemed like a strange combination. 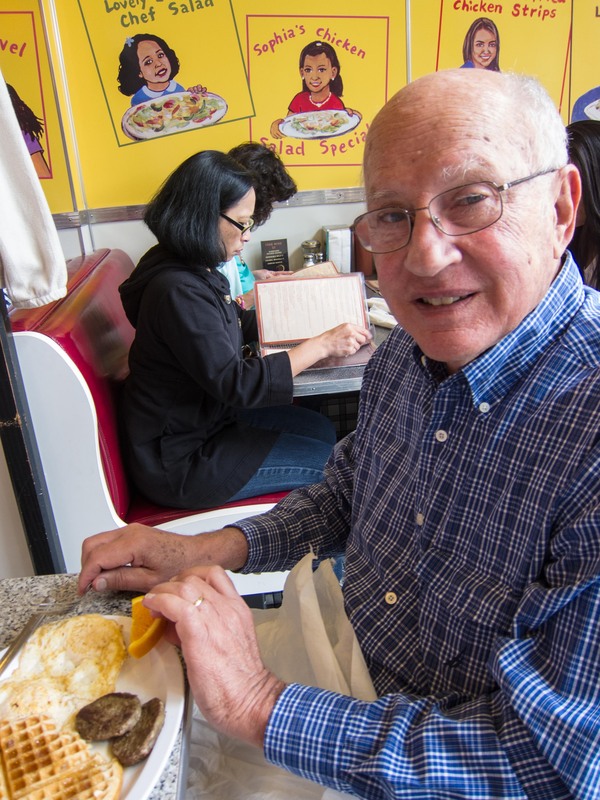 Then in Memphis, Mike and I were in a very nice dinner establishment offering “flights” –they had 39 entrees on the menu and you could pick two or three of them, getting appropriately sized portions, and one of the highfalutin’ choices was, you guessed it, chicken and waffles. So when I heard that there was place in Walnut Creek in called Chicken and Waffles, it was ordained that there was a visit for lunch in my future. Today, when I should have been playing bridge with Mike, the club was closed (for Mike Lawrence’s lessons), so the four of us went to try it out. Right on Mt. Diablo Blvd, C&W is one of a number of restaurants in the same building as Cost Plus World Market and the movie theater. 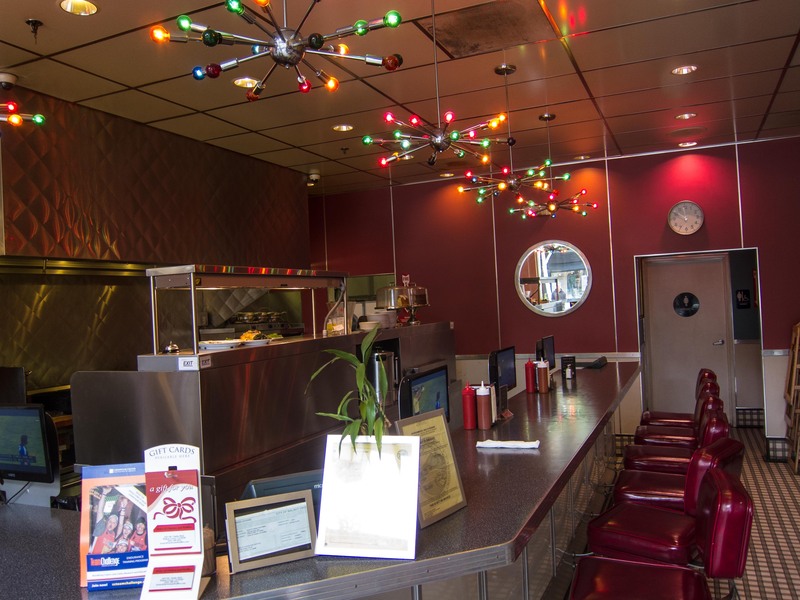 The decor is 60’s diner. The noise level is loud–was asked them to turn down the music a notch or two, but I don’t think anything happened. The cheerful staff. 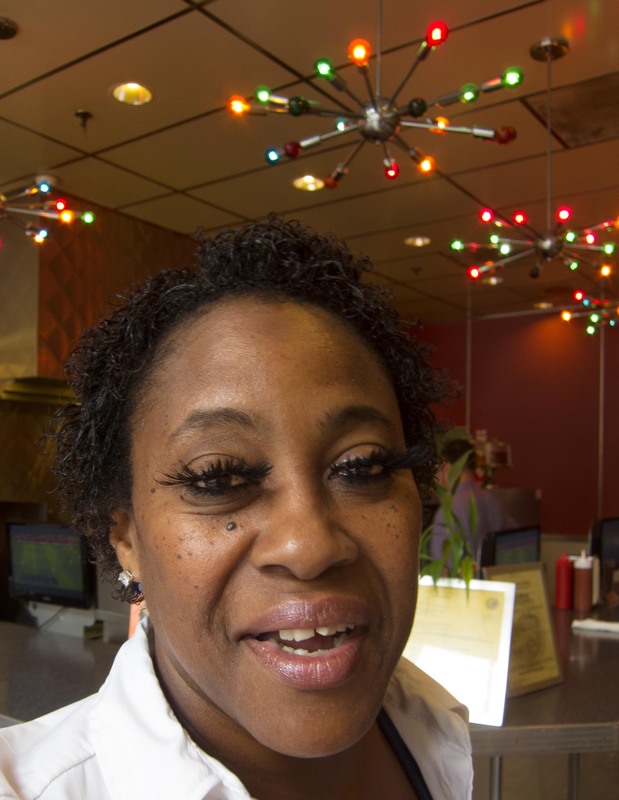 With those eyelashes, I don’t think she’d know if it was raining. Chicken. Waffle. Grits. Classic southern food, well prepared. The menu is large, with a great selection of down home cooking. 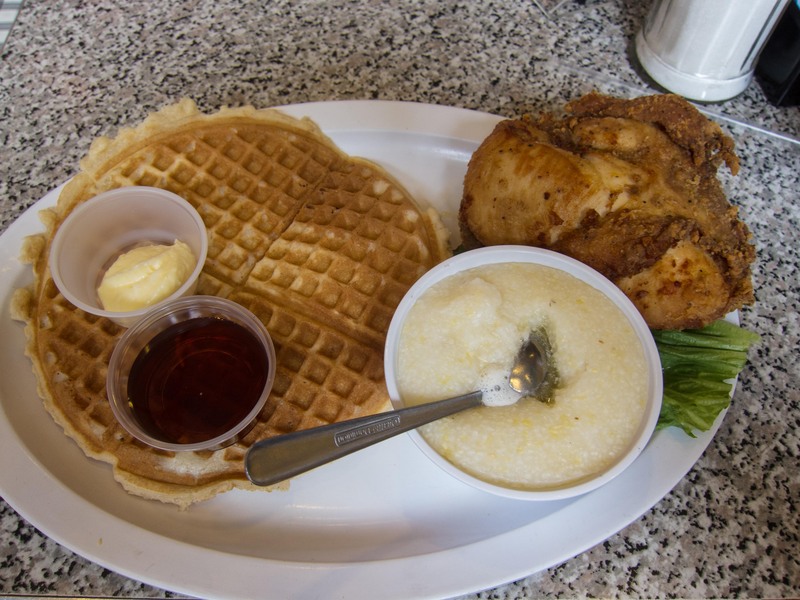 But the name of the place is Chicken and Waffles, and that’s what I was there to eat, so I ordered the first thing on the menu–one waffle, a “succulent breast” of chicken and a bowl of grits. The waffle wasnt’ really hot–I wonder if they make a bunch of them in advance. The chicken, though, was great. We don’t get much in the way of genuine Southern fried chicken, and this is the real deal. It was also the biggest darned chicken breast I’ve ever seen. The bowl of grits was equally good. Grits is like a thick cream of wheat, or poor man’s polenta. Add plenty of butter and either sugar or salt and pepper, and it’s like a quick trip Mississippi. Linda ordered a bowl of black eyed peas and rice for us all to share, and it was as if New Orleans exploded all over us. These people know their way around a pot of beans. This place will never be mentioned in the Guide Michelin but it sure is a good place for lunch–or a late snack. They’re open until 4 am on the weekends if you just can’t sleep for want of a waffle and some chicken. Give it a shot.